AN POST HAS reminded customers of the dates they must have sent post by in order for it to reach its destination before Christmas. Anyone who wants to send a parcel to European destinations other than Great Britain should do so tomorrow, and all post offices will be open in the morning. 18 December is the latest date to be sure of card delivery to mainland Europe in time for Christmas. Parcels and cards to Great Britain should also be posted by 18 December, and by 19 December if going to Northern Ireland. 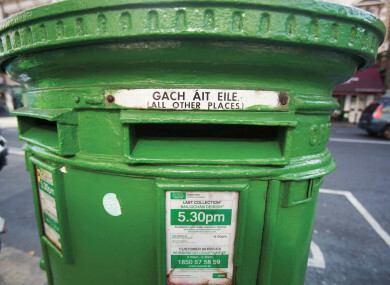 While the latest date for guaranteed delivery within the Republic of Ireland is 20 December, An Post recommends getting cards in the post as soon as possible. The company said parcel volumes have doubled since last year. We advise customers to always use full postal addresses, to write clearly, seal all items carefully and to use lots of wrapping paper and tape on parcels. “A return address on all items will allow us to safely return items that cannot be delivered,” a spokesperson said. An Post employees are performing festive carols in Dublin’s GPO every lunchtime during December and all members of the public are welcome. Email “Sending Christmas post? Here are the dates you need to know ”. Feedback on “Sending Christmas post? Here are the dates you need to know ”.